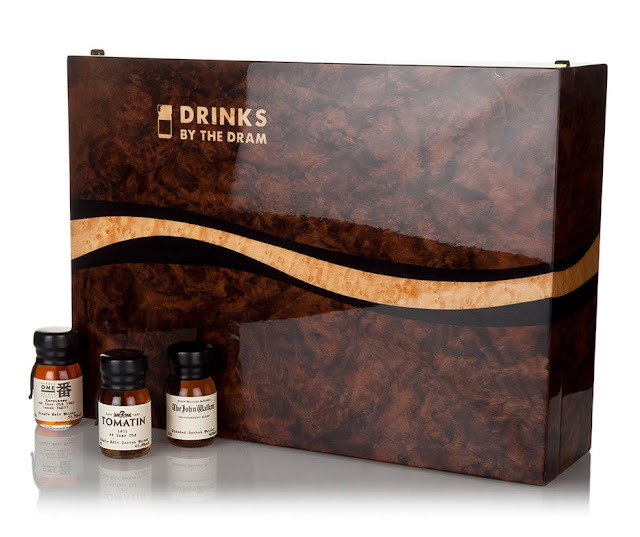 Much-loved spirits retailer Master of Malt have again launched their series of advent calendars, covering the full gamut from whisky to gin to cognac to bourbon to (eep) vodka. 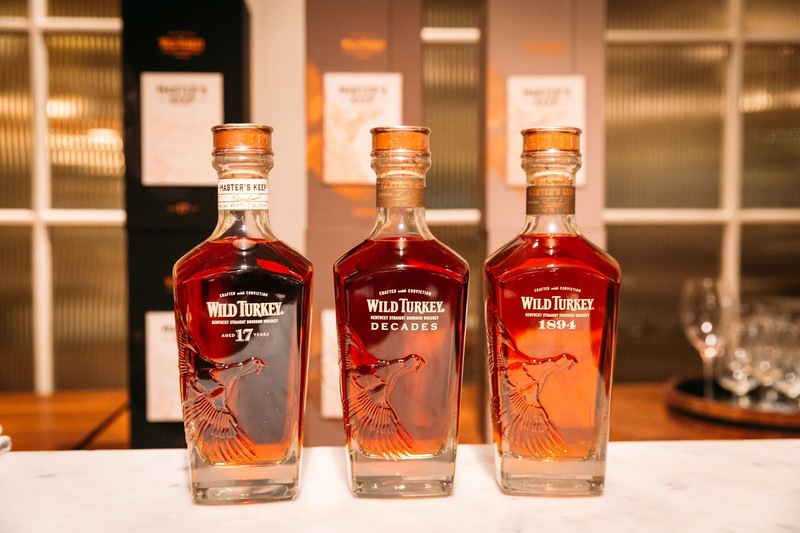 Prefer tequila, mezcal or Armagnac? They've got you covered too. The calendars this year span two pages of the MoM site, and again include an incredible £8,333 "Very Old and Rare" calendar (ex-VAT) which includes a 48 year old Karuizawa, 46 year old Balvenie DCS, 60 year old Glenfarclas and many other bottles (OBs and IBs) from distilleries past and present. 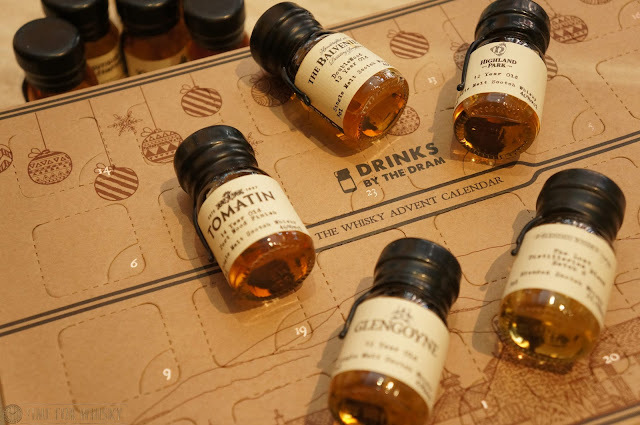 We reviewed 2016's whisky calendar here, and found it an incredibly clever and enjoyable way to try 24 drams without having to comit to a full bottle. The full range of 2017's calendars can be pre-ordered from here now. 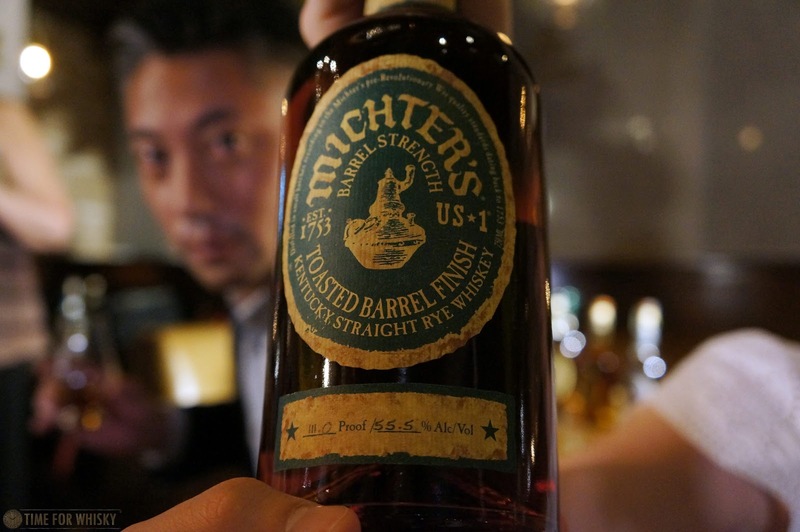 We've been fans of Michter's for a while here at TimeforWhisky - and so has Hong Kong it seems - particularly on-premise, with a number of bars using Michter's range of ryes and bourbons in some incredible cocktails (more on that below). In fact, so big has the rise of Michter's been, that last year the brand appointed their own brand ambassador for Asia, John Ng (although prior to that, global sales director and son of founder Matt Magliocco lived in Hong Kong for several years). 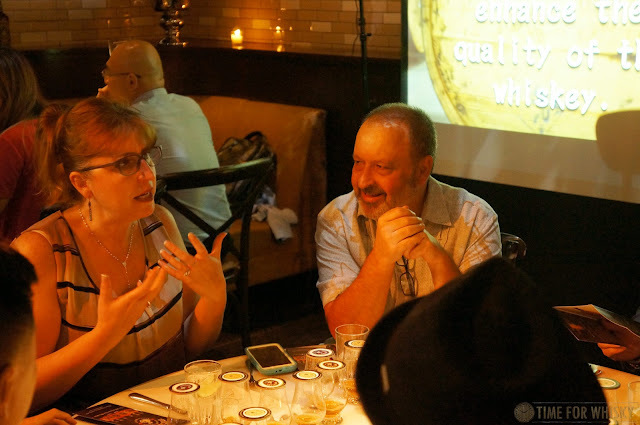 Matt and John were joined recently in Hong Kong by Master of Maturation Andrea Wilson, who had flown in from Louisville for the distillery's first Hong Kong media launch dinner, held at Hong Kong's favourite American restaurant Lily & Bloom. Steph and I couldn't think of a better way to spend a Monday night. Kicking things off with a cocktail was a welcome way to beat the 35ish degree heat outside - especially when that cocktail mixed Michter's Rye, ginger, pineapple, lemon and smoked tea spirit. Known as the Bomberger Buck, and served in a similar fashion to a Mint Julep, it was the perfect start to the evening, and evidence that even after 7 years, the drinks program at Lily & Bloom still continue to impress (in particular, since John Nugent's recent hiring as Head Mixologist). 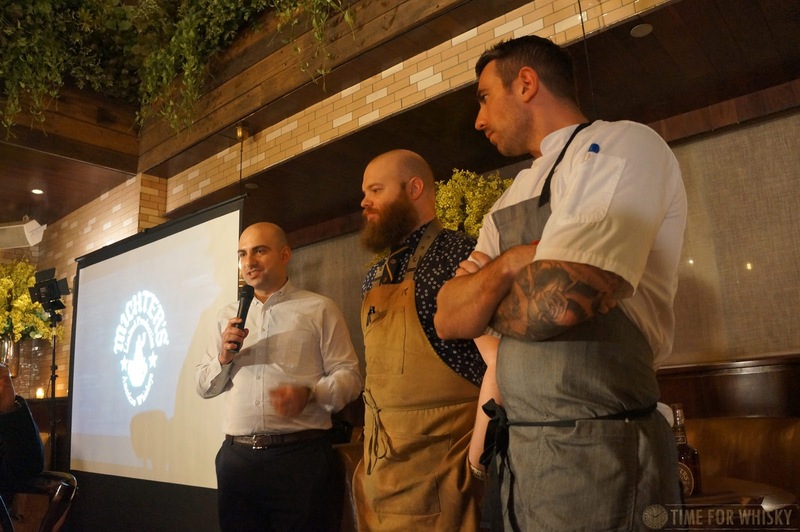 After taking our seats, Matt introduced John and Executive Chef Chris Grare, who talked us through the 6-course menu, explaining it as American-focused with some Asian hints, bringing out charred, smokey flavours with some spice and caramel. Matt talked us through a brief history of the Michter's brand, and in particular its most recent incarnation under his family's stewardship. Matt explains the company's recent history in three phases - the first involving aged casks of American whiskies being purchased from other distilleries, the second involving whisky produced (using Michter's-spec mashbills) at other distilleries, using rented time known as "Michter's Days", and the third, since August 2015, involving whisky being produced at their own distillery. 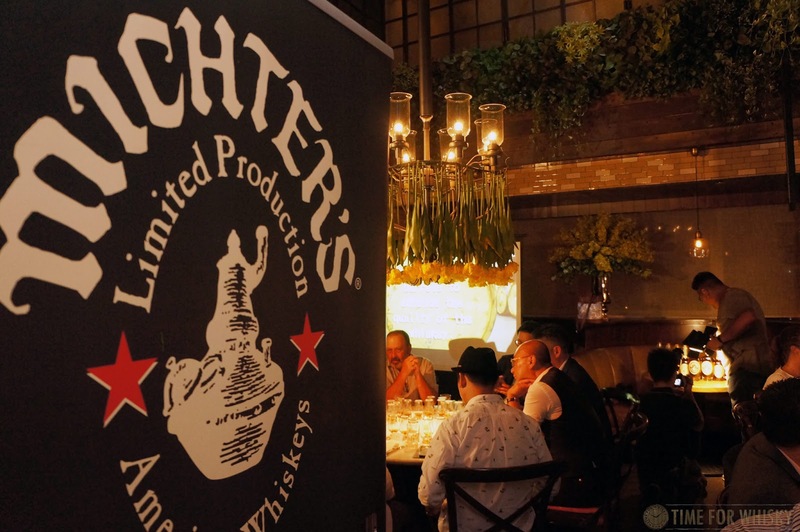 After this brief history, the night's guest of honour Andrea Wilson walked us through a detailed and informative overview of Michter's production (touching on topics including oak drying, barrel entry proof and heat cycling), making it clear that the future of Michter's maturation programme is in safe hands. 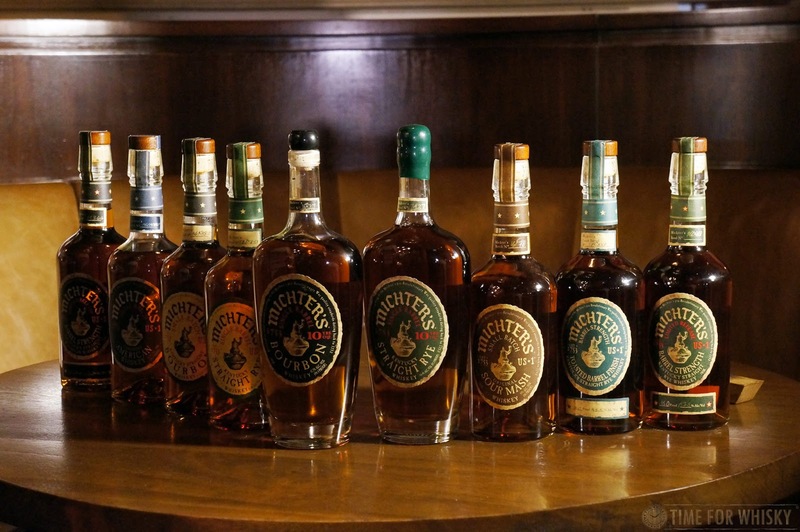 One thing I've always found interesting about Michter's is the number of whiskies in the range. 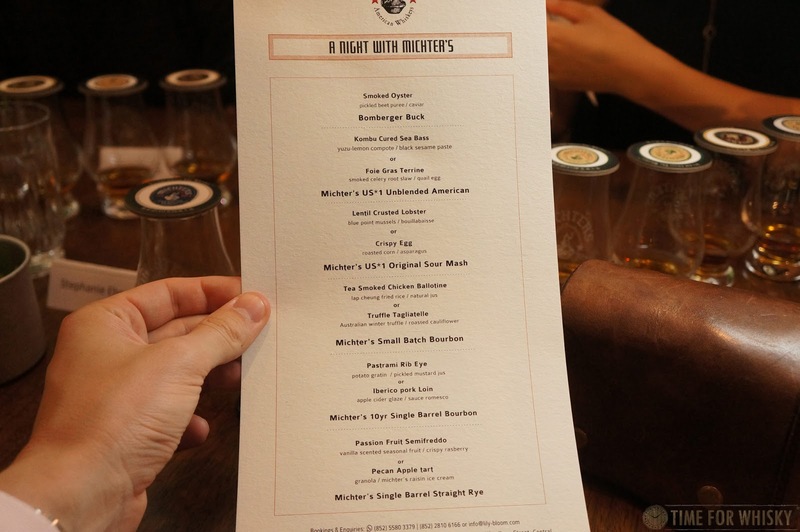 There are Ryes and Bourbons, both in "small batch" and single barrel variety. There are age statement varieties (including a 25 year old Bourbon and a 25 year old Rye, both of which we've been fortunate enough to try), there's a Sour Mash, an "unblended American whisky", various limited releases (including popular Toasted Barrel finishes), and barrel proof varieties too. 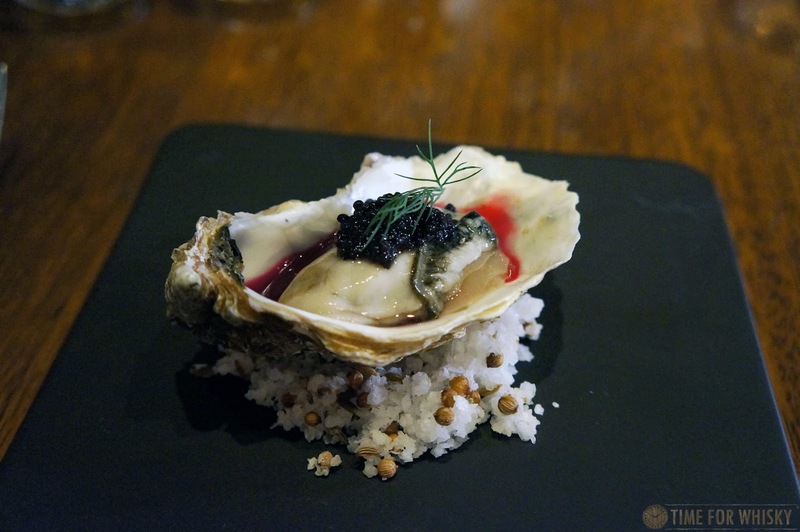 ...little did I know we'd be tasting at least 9 of these on the night! 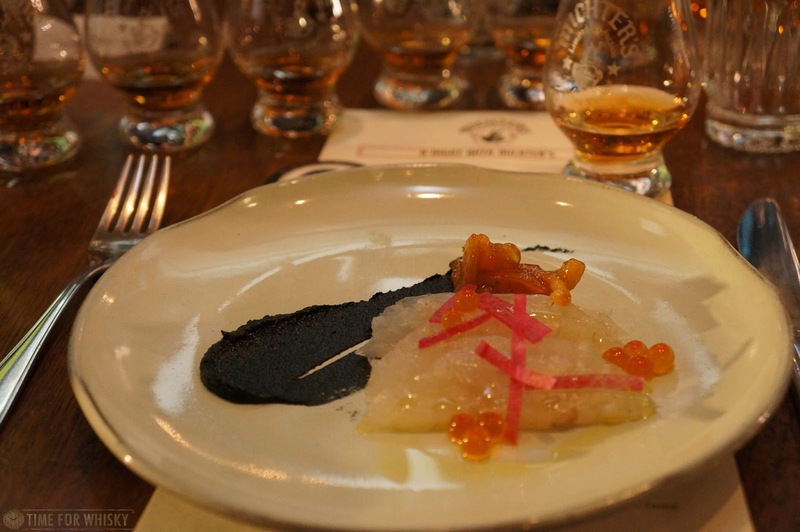 Following the Smoked Oyster paired with our welcome cocktail (see above), Kombu Cured Sea Bass (with yuzu-lemon compote and black sesame paste) came next, paired with Michter's US*1 Unblended American Whiskey, with the Yuzu in the dish proving a nice counterpoint to the sweetness of the whiskey. 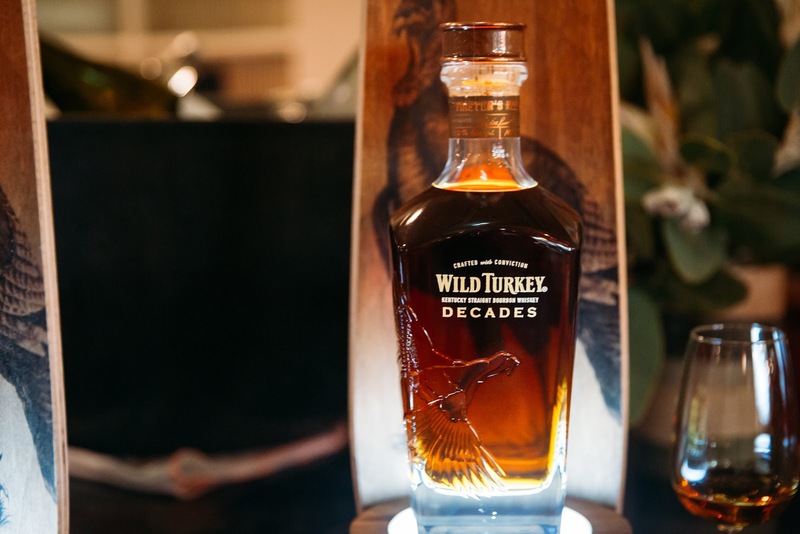 Both great on their own, but better together. Off to a good start then! 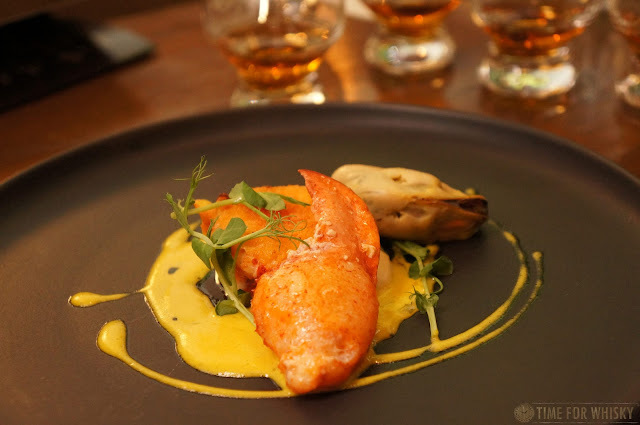 Lentil-crusted Lobster (with blue point mussels and bouillabaisse) came next, paired with Michter's US*1 Sour Mash Whiskey. 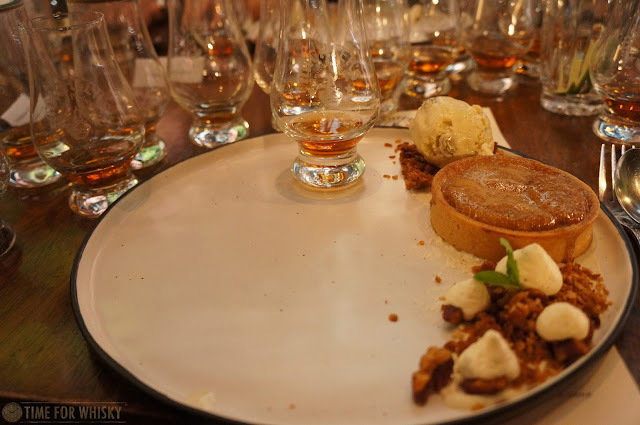 As I find the Sour Mash to be a fairly subtle whisky on its own (an easy and enjoyable everyday whisky though), I found the whisky and food complimented each other well here, but in a subtle way, without either really changing or accentuating the other. 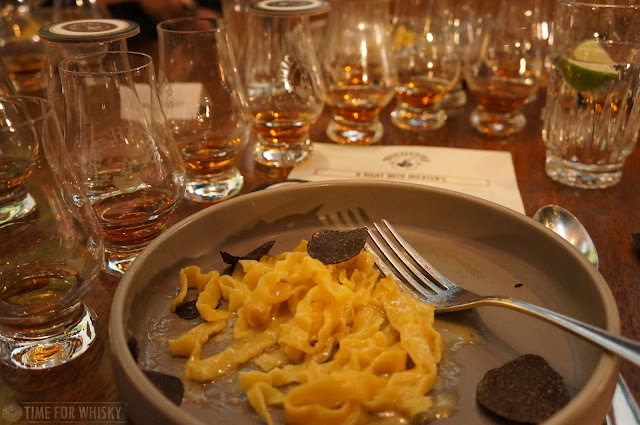 Course four was Truffle tagliatelle (with Australian winter truffle and roasted cauliflower), paired with Michter's US*1 Bourbon, a great match, with the Bourbon surprisingly turning up the creaminess of the pasta significantly. 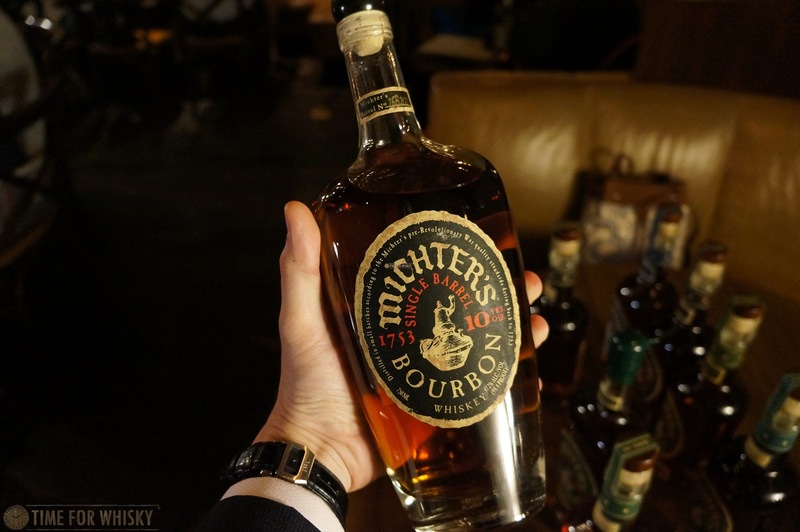 Bourbon and steak is a hard pairing to beat, and so it was when Pastrami Rib Eye (with potato gratin and pickled mustard jus) was paired with Michter’s 10 Year Old Bourbon. Decadent? 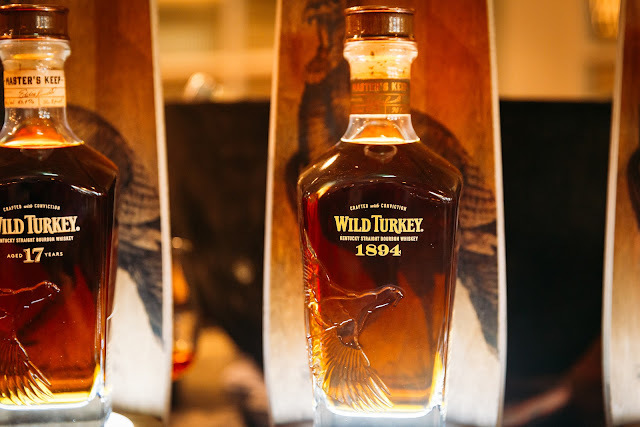 Perhaps, but a fantastic combination, with the rich sweetness of the Bourbon playing brilliantly with the rare steak. 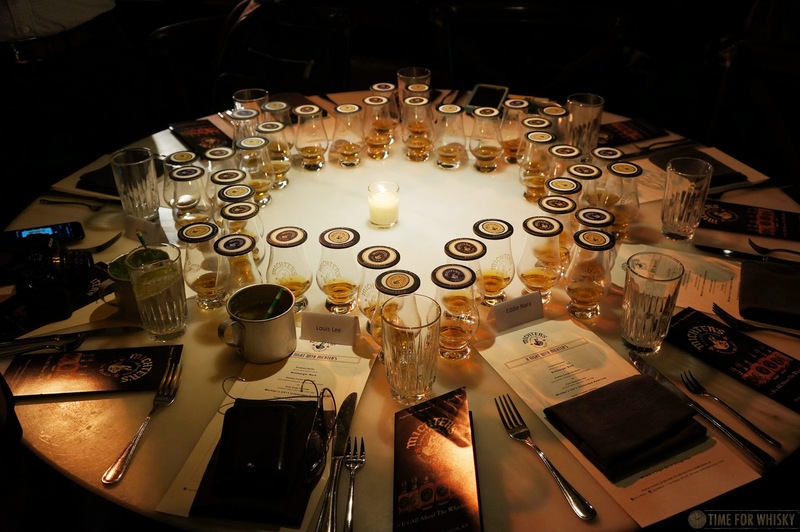 Had the meal ended there, we all would have walked off praising the chef and whiskies, but there was one more dish to go, and it was an absolute winner. Pecan Apple Tart (with granola and Michter's raisin ice cream) was very good when paired with the Michter's US*1 Single Barrel Straight Rye, but in my opinion was even better with the 10 Year Old Bourbon - the two making a deliciously sweet and rich pairing, with the Bourbon adding vanilla and honey notes to the already flavoursome dish. 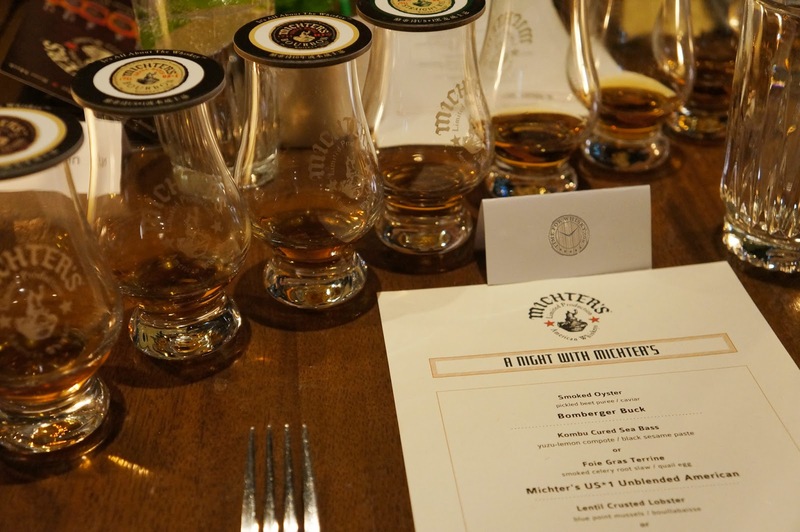 With 6 wonderful pairings down, it was time to leave (it was Monday night after all), but not after a few surprise whiskies made their way out, including one (at the time) unreleased Michter's, the Barrel Strength Toasted Barrel Finish Straight Rye, which put a slightly spicier twist on a whisky I already loved for its spicy profile. After that it really was time to leave, with memories of wonderful dishes and equally delicious whiskies to carry us home, not to mention the take-home pre-batched "Snickers Old Fashioned" cocktail, made with Michter's US*1 Unblended American Whiskey, vanilla demerara, black walnut and aztec chocolate. 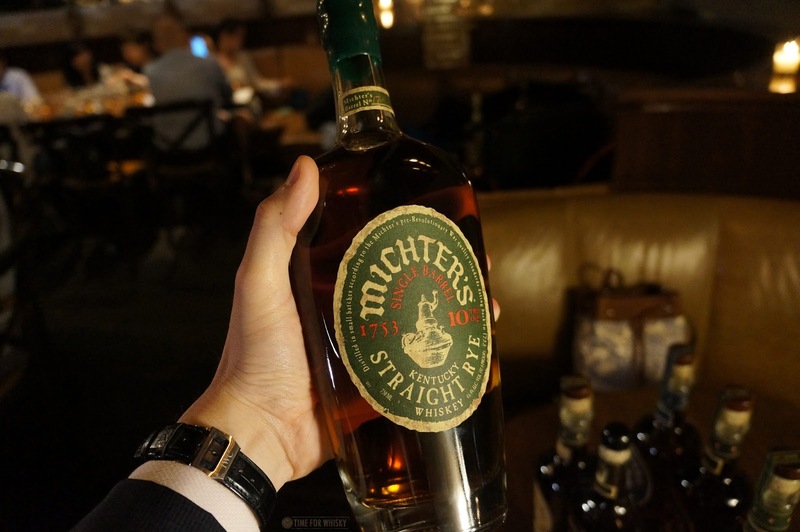 One of the best cocktails I've had in a while, and proof (again) that Michter's works wonderfully both in a cocktail and when served neat. 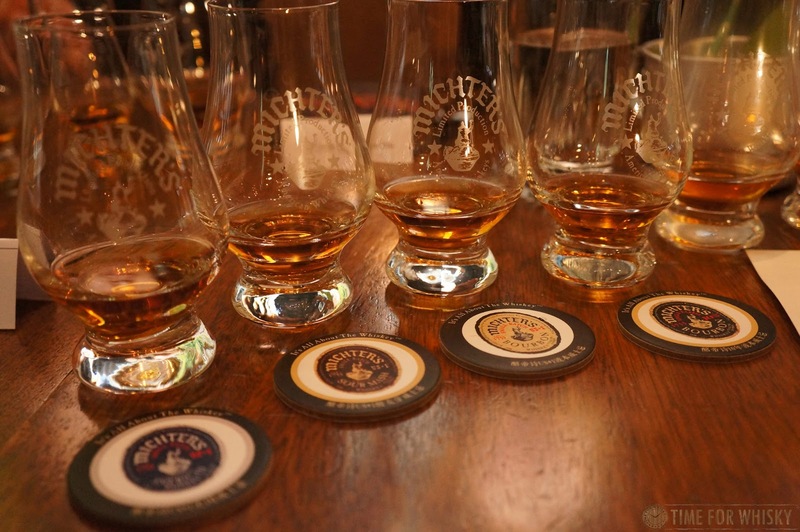 TimeforWhisky.com would like to thank Michter's Whiskey Distillery, Andrea, John and Matt for the invitation.